With the arrest of a person, the city police have claimed to have cracked the highway robbery that took place three days ago. Two armed assailants had robbed a Fatehgarh Sahib-based businessman of a bag containing Rs 2.95 lakh, a laptop and important documents. Politicians are leaving no stone unturned to get political mileage out of the murder of 23-year-old Gagandeep Singh Natt, who was allegedly beaten to death by armed assailants at the 'behest' of Deputy Mayor RD Sharma. Yet another scam involving taking rebate in central excise duty and service tax by wrongful means has come to light. Many industrialists, including those from Punjab, are under the scanner of the Excise and Taxation Department. Though the Chief Election Commissioner has increased the limit for transaction of money up to Rs 10 lakh during the elections, there is fear among businessmen. Traders are avoiding carrying cash during the ongoing election code of conduct keeping in mind the seizure of cash during the Vidhan Sabha elections. After successfully running an awareness campaign on encouraging youth to exercise their right to franchise, “college ambassadors” are now busy in their annual examinations. 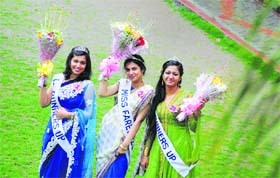 The awareness campaign was run by 18 "college ambassadors" in the city colleges. While the affluent residents of the city are feeling harassed with the election fever and frequent VIP movements, the poll mode has brought smiles on the faces of people living Below Poverty Line (BPL). The state committee of the Marxist Communist Party of India (United) has decided to support the honest candidates of pro-people parties in the state. This resolution was passed during its meeting held at KK Kaushal Memorial Bhavan, Doraha, today. The annual convocation of Christian Medical College, Christian Dental College, College of Nursing and College of Physiotherapy was held here today. Dr Beant Singh Ahloowalia, former consultant, Joint FAO/IAEA Division, International Atomic Energy Agency, Vienna, was the chief guest on the occasion. Residents from different age groups and walks of life are increasingly opting to pedal to their destination. 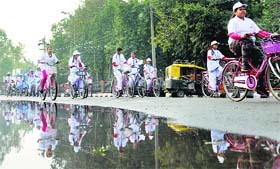 By making cycling a part of their routine, these residents are not only keeping themselves fit but are also contributing in making the air fit for breathing. The Education Department is all set to conduct the Punjab School Education Board Class X examinations from tomorrow. 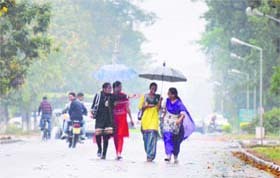 District Education Officer (DEO) Paramjeet Kaur said foolproof arrangements had been made for the examinations. March is being celebrated as Kidney Month at Christian Medical College. Activities during the month, on the theme “Stop Kidney Injury”, aim at raising awareness on kidney-related diseases in order to ensure early detection. Residents of localities situated on Sherpur Road have been facing a lot of inconvenience due to the poor condition of the road. 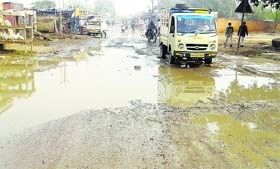 This road connects dozens of villages, including Sherpur Kalan, Kothe Fatehdeen, Kothe Baggu, Kothe Jeeve Ke, Kothe Sherjang, Sheikhdaulat, Galib Kalan, Kaleran and Galib Ran Singh, with the town. Even as claims and counterclaims about switching loyalties continue, Ward No. 26 councillor Ashok Kumar joined the Bharatiya Janata Party (BJP) today under the leadership of the BJP district president Parveen Bansal. The Health Department today collected 22 samples from different places located near Doraha. These samples were collected on the directions of Civil Surgeon Subhash Batta. Ludhiana: ABC Montessori School celebrated its annual function at PAL Auditorium of Punjab Agricultural University. 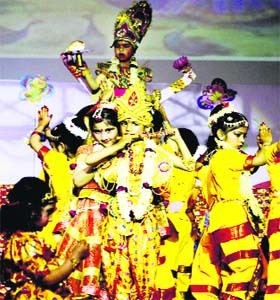 The theme for the function was "Corruption in Education and Fraudulent NRI marriages". Students raised their voice against these social evils. The programme commenced with the lamp-lighting ceremony. Nursery and kindergarten students staged a devotional drama, Chaturbhujam. Ludhiana: A training course in fruits, vegetables and flower cultivation began at Punjab Agricultural University. Course coordinator Dr TS Riar said the programme was specially organised by the Centre for Training, Directorate of Extension Education, PAU, for progressive farmers of Kathua district in Jammu and Kashmir. In all, 36 farmers are attending the training programme. Ludhiana: Gurmeet Singh Kular has been nominated as the zonal head, chairman and convener of the PHD Chamber of Commerce and Industry, Ludhiana Zone. OP Munjal, chairman, Hero Cycles; Onkar Singh Pahwa, chairman, Bicycle Research and Development Organisation (BRADO); and Manjinder Singh Sachdev, president, BRADO, congratulated the new appointee. Shiromani Gurdwara Parbandhak Committee (SGPC) president Avtar Singh Makkar on Monday asked the office-bearers of all the gurdwara parbandhak committees to motivate children to stay rooted to Sikh culture. Addressing a religious gathering at Sri Guru Singh Sabha, Pakhowal Road, Makkar said it was unfortunate that children were drifting away from the religion. A youth was killed and another got injured after their motorcycle collided with a speeding truck near Doaba Bhaini village. The deceased has been identified as Gurinder Singh (17), a resident of Shalu Bhaini village. 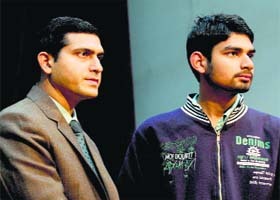 Amritpal Singh (17) from the same village was injured in the accident. 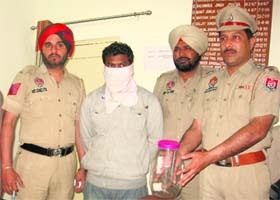 Ludhiana: The police have booked a resident of Fazilka for committing a fraud of nearly Rs 6 lakh with a BJP leader, Ravinder Arora. Ravinder said the accused, Sandeep Kumar, who is his distant relative, was working at his showroom located in Haibowal for the past four years. 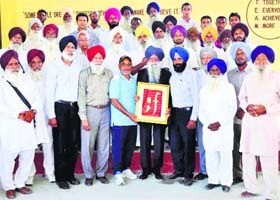 The Sher-e-Punjab Sports Academy, Chakar, near Jagraon, today felicitated internationally acclaimed marathon athlete Fauja Singh for his achievements in the field of sports.